The guide to Native Plants of Accomack and Northampton highlights the beautiful variety of plants native to the Virginia's Eastern Shore. For the purposes of this guide, plants native to Accomack and Northampton counties on Virginia’s Eastern Shore are those that have been part of the local ecology prior to John Smith’s landing and are adapted to the Shore’s local soils and climate conditions, resulting in many benefits to the region, its residents and migratory birds. The Eastern Shore native plants featured in this guide were selected because they are attractive, relatively easy for the home gardener to acquire, easy to maintain, and offer various benefits to wildlife and the environment. 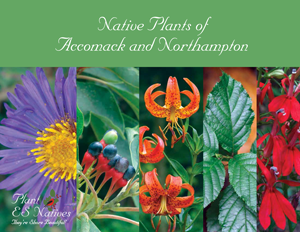 Although this guide is not comprehensive, the native plants featured were selected because they are attractive, relatively easy for the home gardener to acquire, easy to maintain, and offer various benefits to wildlife and the environment. This guide is provided by the Plant ES Natives Campaign to promote the use of regional natives in urban and suburban landscapes for their many social, cultural, and economic benefits, and to increase the availability of these native plants from plant providers throughout the region. Other publications for Eastern Shore landowners about planting natives for migratory birds and other wildlife.